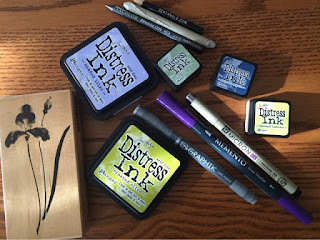 Rubber stamps, ink and tangling. Sometimes it all works together so well. 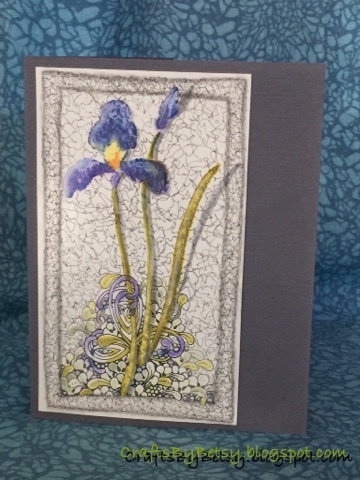 Supplies used include a Penny Black stamp "single iris". I forgot to take a photo of just the stamping. I used the ink pads to ink the stamp and added the purple Momento ink from the pen onto the stamp. I didn't have a dark purple distress ink, that's why I used the Momento. The two inks worked fine together. After I stamped onto damp watercolor paper, the image was pretty light and splotchy, so I touched up the stamping by scribbling some ink onto my craft sheet and using my waterbrush to pick up the inks to fill in any missed or light areas. Then I let it dry thoroughly before tangling with the black 005 Sakura Pigma Micron and the graphite Derwent Graphik line maker 0.1. Tangles used: Mooka, Skwim with Flux, Tipple and Stiritup. I added more distress ink to the tangles here and there with my waterbrush and added graphite shading and gray Fabrico marker (whoops, left it out of my supplies picture). Here is the final result mounted on an A2 sized card I cut from gray cardstock. 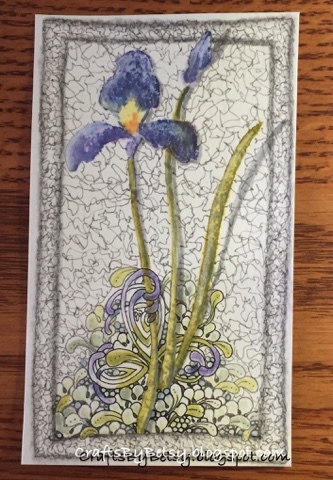 Wonderful and very artistic card!